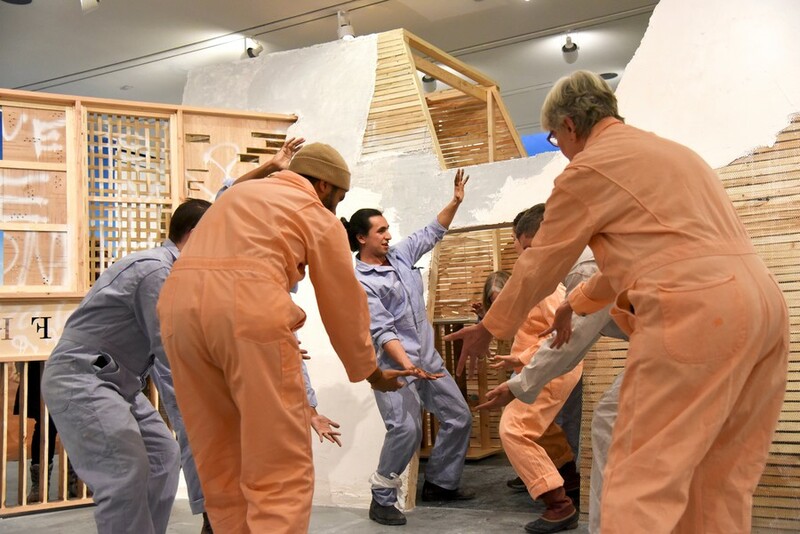 Act V (Plaisance) of Atlas Unlimited took place at the Logan Center Gallery on February 1st and featured a cast of "Builders" activating the gallery with the artists Pandian and Zins-Browne. Atlas Unlimited (Acts V–VI) comes across more as a work in progress than as a finished exhibition. On Thursdays, artists come in and work on the space; the works on display are therefore constantly evolving. The brainchild of Karthik Pandian and Andros Zins-Browne, the show comments on the aftermath of the Arab Spring through the lives and stories of migrants forced into displacement because of it. At each location where the show has been on display, it takes on new, localized narratives and subjects them to the same treatment as its central one. The gallery is split in half by a long, seemingly precarious wall, and a viewer needs to slouch to fit through a door cut into the center of a wooden structure to get to the other side. The wooden planks are covered in spray-painted words like “baby kakes” and “Leave Me Alone” (a reference to a previous Act). Inside the wooden structure, pieces originating from the Middle East sit carefully displayed. An ancient statue of Horus as a falcon and his crown and headdress (both from the Oriental Institute) sit separated in different glass cases, along with a large camel bone and an almost unnoticeable figurine. As one walks through the door of the structure, Horus may be heard commanding one to halt, or singing a song. 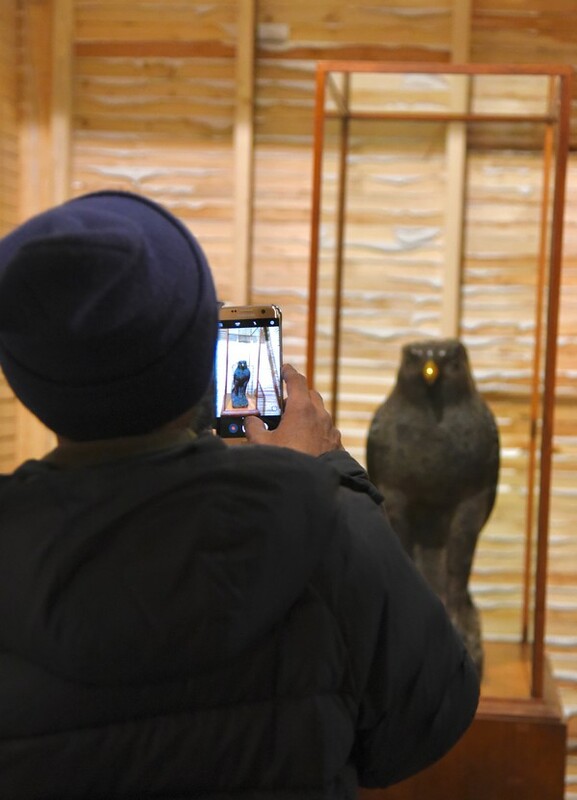 A 3000 year-old statue of the ancient Egyptian god Horus on loan from the Oriental Institute greets visitors to the gallery. Once through the wall, a viewer can see large murals on canvas hung on the walls and pieces of styrofoam laying on the ground, including a blue eye with dangling tassels. These are parts of a styrofoam camel from a carnival in Belgium, and create an almost surreal atmosphere; their incomplete nature is very suggestive, reminding one of ruins or missing archeological remains. The striking canvas pieces cover huge sections of the gallery wall. One depicts a dusty, industrial city on one side and a desert on the other, while a third is a continuation of that desert. The two canvases are connected by blue outlines drawn directly on the wall, filling in the missing gaps between the murals, as if telling lost stories. An artist in a jumpsuit meticulously darkens a blue outline on the wall. His focus makes it feel as though one is in his studio, rather than at an exhibition. The panels dividing the gallery in half were designed and built by students in the Design Apprenticeship Program, led by Builder Gabe Moreno. In a small side room, a so-called “Builder” in a tent pieces together individual parts of a broken limestone sculpture. 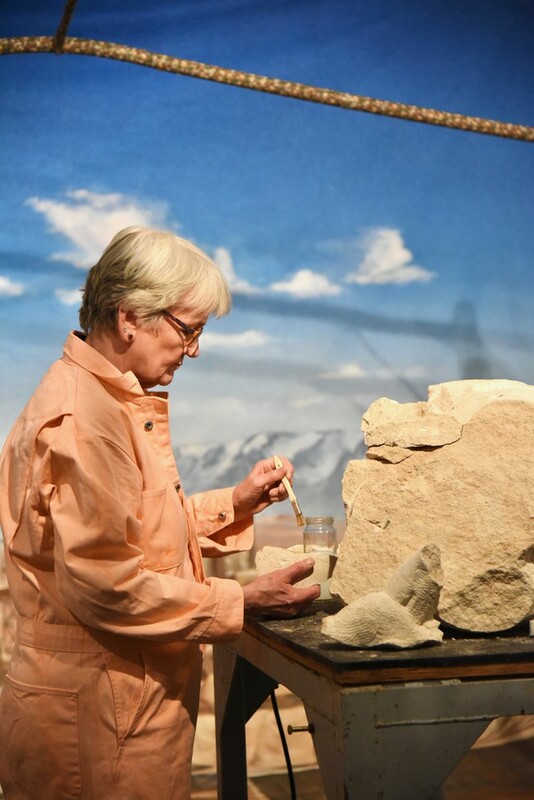 Builder Jane Foley, an accredited conservator, tells visitors that she does not know what the original sculpture looked like, just that it was destroyed. So far, she has found a nose, probably from a camel, and a couple of legs. She picks up another piece, trying to fit it together with a larger one, as if connecting separated puzzle pieces. This reconstruction speaks to the exhibition as a whole, recounting tales of dismantlement, settlement, and rebuilding anew. Builder Jane Foley is an accredited conservator who is restoring a sculpture which had been demolished in a previous act of Atlas Unlimited. Atlas Unlimited (Acts V–VI) allows visitors to understand its meanings and experience its stories interactively. 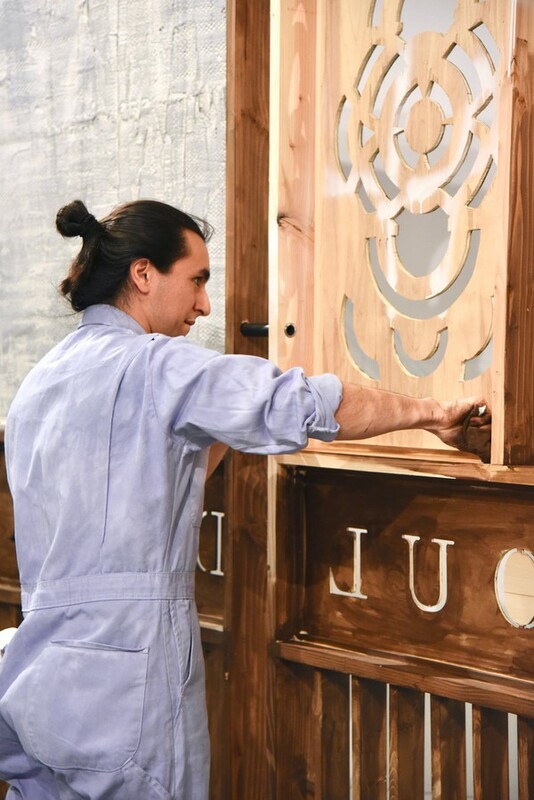 The Builders who activate the gallery every Thursday, ranging from an archaeologist to a conservator and a theater maker, continually produce, reproduce, and un-produce the stories encoded into the various artifacts and architectural fragments composing the space. 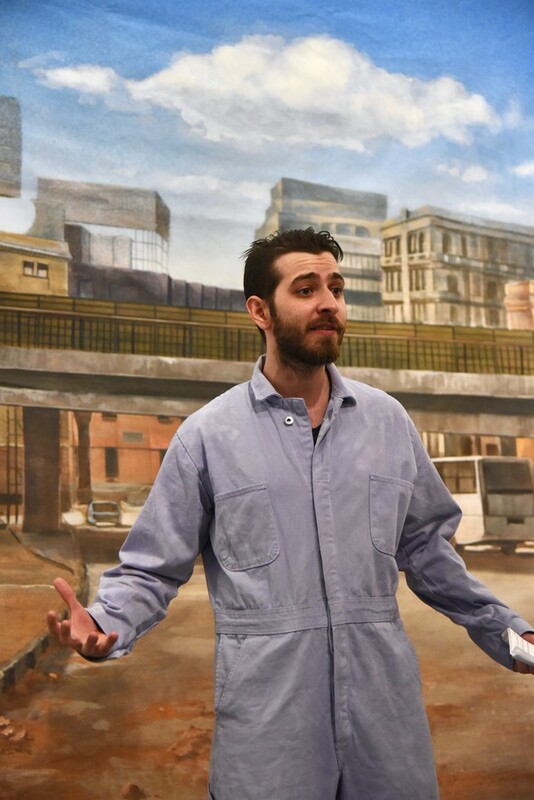 Builder Sami Ismat plays the part of Syrian sculptor and refugee Zakaria Almoutlak in a play in-progress visitors can workshop with him every Thursday. Atlas Unlimited (Acts V–VI) is on display at Logan Center Exhibitions until March 17, 2019.